I like the computer knowledge portion since it discuses the topic in detail perfectly required for any competitive exam. Test of reasoning, general awareness, language skills (English) are all good.. But im little disappointed with the civil engineering portion.. 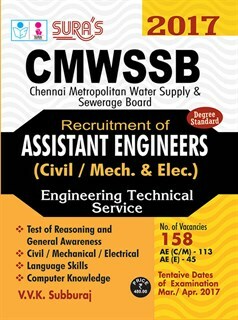 Though it contains 390 MCQs I expected at least 50 to 60 questions in each of the topic of civil engineering given in the CMWSSB syllabus. Otherwise I'm satisfied with all other portions of this book.